Synopsis: Laurie Davis has always followed her passion. After escaping family drama to start a new life in New York City, she’s up for whatever challenges life brings. So when an opportunity arises for her to use her travel industry expertise and serve as an assistant and tour guide for her idol, Pamela Lambert-Leigh, star of television’s Tea-Time with Pamela, she jumps at the chance. But Laurie’s exciting adventure ends up entailing a lot more than scouting locations for the cake queen’s new cookbook when Pamela’s sassy mother and sulky, rebellious daughter tag along for the trip. As they cruise around bakeries in New England trading local delights like Red Velvet Cake and Whoopie Pies for British specialties such as Victoria Sponge and Bakewell Tarts, more secrets than recipes are revealed. My take: Laurie couldn’t wait to set off on the tour with Pamela and her mother, Gracie and daughter, Ravenna. Almost immediately, though, she saw that things between the three women were tense. As the days go on Laurie learned the reasons for the strained relationships. She becomes involved in a secret that she’s not pleased to know and hopes it will be out in the open very soon. The other principals have their own thoughts on how the secret should be revealed. I think my favorite characters of the book were Laurie, Gracie, Charles and Harvey. They seemed so genuine and honorable. You’ll have to read the novel to know about Charles and Harvey. If you’ve ever wanted to go on a road trip in New England, and you like cake, this novel could be a guide. I’ve made note of a few places I’d like to visit. 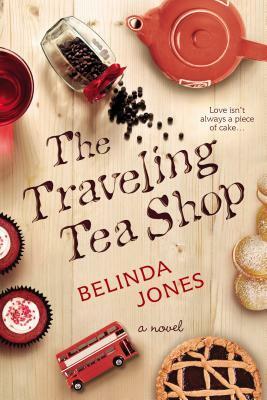 Belinda Jones’ story is about family, friendship, secrets, apologies and forgiveness. And food – dessert, to be precise. I enjoyed it and recommend it to fans of contemporary fiction and foodie fiction. This one sounds like my cup of “tea.” LOL. And yes, I would love to go on such a tour. Thanks for sharing…and I’m glad you enjoyed it. I think you’d like it, Laurel! This does sound lovely. Wonderful review, Mary! I so want to read this one.. I a Tea lover and I know I am going to enjoy this book. Hi Anna! So sorry about your copy of The Traveling Tea Shop – you are not alone! A mysterious number of books went awol from Penguin! Did it ever show up? I can put in another request if you like? I reserved this at the library, I have seen a couple fantastic blog reviews for it! I think I’d love this one, tea and relationships, definitely my type of read.